QUEST 2015 Conference & EXPO will be hosted at the Loews Atlanta Hotel (Midtown) in Atlanta. Located within walking distance to a number of attractions, points of interest, and Piedmont Park, Atlanta’s Central Park, the hotel is the ideal location for your QUEST experience! 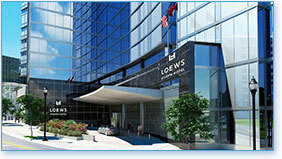 Learn more about guest rooms, amenities, and activities at the Loews Atlanta Hotel. A special nightly rate of $199.00 (plus applicable state and local taxes ) has been negotiated for conference attendees. The group rate is subject to availability. The regular room rate is substantially higher than the negotiated rate. Since the number of rooms at this group rate is limited, be sure to make your hotel reservation at the same time that you register for QUEST 2015. For help with last minute hotel reservations please contact Kathy Meindl at kmeindl@qaiworldwide.org or call 407-363-1111 x301. Take Interstate 75 South to the Exit 250 (17th Street/14th Street/10th Street), turn left at the first light (14th Street) and proceed east to Peachtree Street. Turn right on Peachtree Street. Loews Atlanta Hotel is located on the left hand side. Take Interstate 85 South to the Exit 250 (17th Street/14th Street/10th Street), turn left at the first light (14th Street) and proceed east to Peachtree Street. Take Interstate 75/85 North to the 10th/14th Street Exit; turn right at the first light (10th Street). Proceed on 10th Street. At the 3rd light take a left onto Peachtree Street. The Loews Atlanta Hotel is one block on the right. Continue east on Interstate 20 to Interstate 75 or Interstate 85 North to the 10th/14th Street exit. Turn right onto 14th Street. Take Interstate 75/Interstate 85 North to 10th/14th Street. Merge onto Williams Street NW, Turn right at 10th Street. Turn left at Peachtree Street. Loews Atlanta Hotel will be on the right.